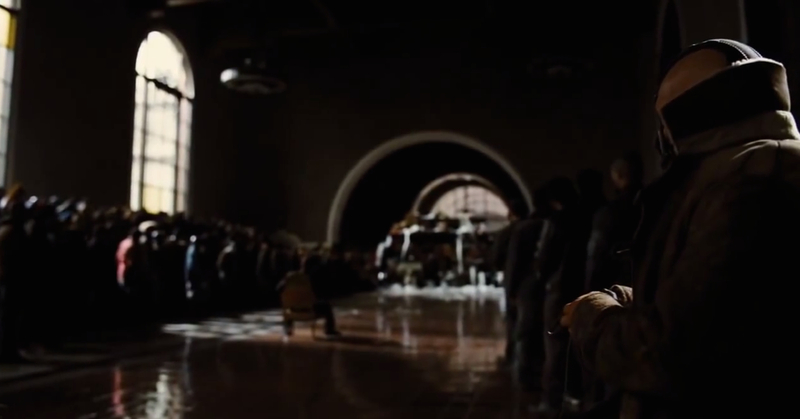 A scene from the “The Dark Knight Rises” that was filmed in the old ticket room at Union Station. Credit: Warner Bros.
Good morning, readers and listeners! Above please find our first Metro podcast. The subject: filming at Los Angeles Union Station over the decades, a subject that Kim tackled earlier this week as part of her ongoing series of posts on Union Station’s 75th anniversary. We’re new to the podcast thing and it’s going to take a few of these to completely find our footing in the audio world. If we sound like podcast rookies, well, we are. Please bear with us! That said, I’m really excited about this. It’s great to post articles on the blog, but I think it’s also important for our riders and taxpayers to literally hear the voice of their government. I hope you enjoy our initial offering and we should have more podcasts soon. It occurs to me that if you’re looking for a blog idea, you could play a game of Seven Degrees of Union Station & see if you can connect actors to Union Station in movies within seven movies. You’re welcome.